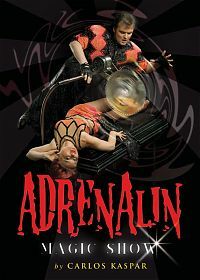 Our latest "Adrenalin Illusion Show" offers up to an hour of great entertainment and a selection of the best illusions ever seen. The impression is amplified by 18 original and splendid costumes used during the show, the custom-composed music and special effect lighting. Looking for an unusual and riveting entertainment as a surprise of the evening? Choose a shorter, 20-minute version with the illusions of your own choice. Do you wish to entertain a smaller company without making compromises? 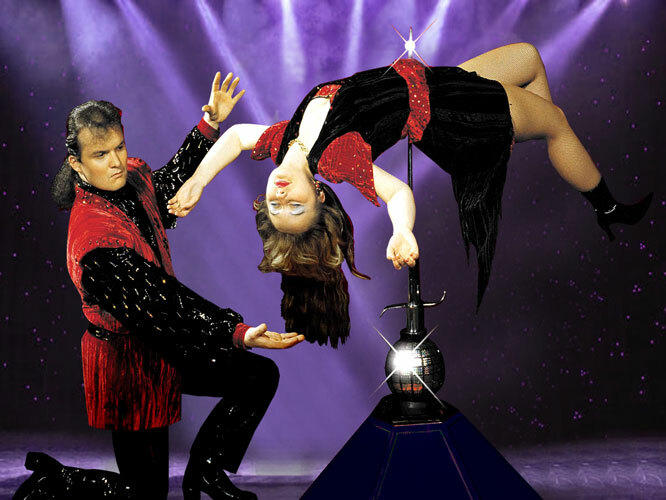 Choose the best illusion from our offer and you will not be disappointed. What can you see in our show? Tiger's Cage - A woman - tigress appears absolutely unexpectedly in an empty cage (photo). Origami - A Japanese mystery of the century from David Copperfield's repertoire. The lady partner disappears in a 30 x 30 x 30 cm cube and no weapons, not even the Japanese katanas can hurt her (photo). Deadly Saw - An illusion for those who have nerves of steel. The level of adrenaline rises as the saw edge cuts through the body of a brave girl. The wheel of the circular saw is guaranteed to be made of steel as the spectators can see the saw to cut a wooden rod (photo). Levitation - A baleful witch after being hypnotized levitates on her broom without any support in the height of approximately two metres above the ground. A ring is moved along her body to show that there are no poles to support her. Very impressive (photo). 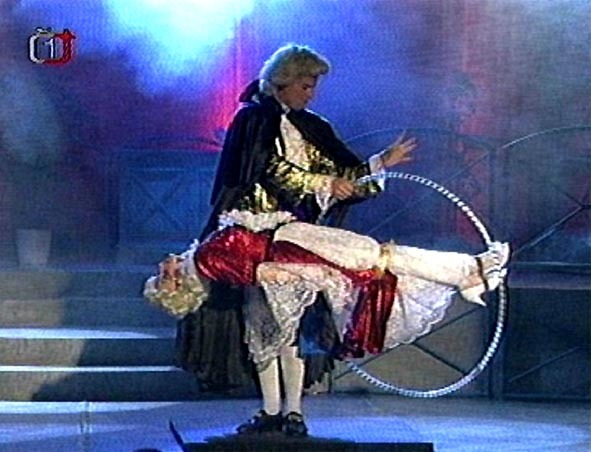 A hypnotized lady sleeping on giant candles - The illusionist's partner becomes hypnotized and levitates on giant candles as if she was turned into stone. 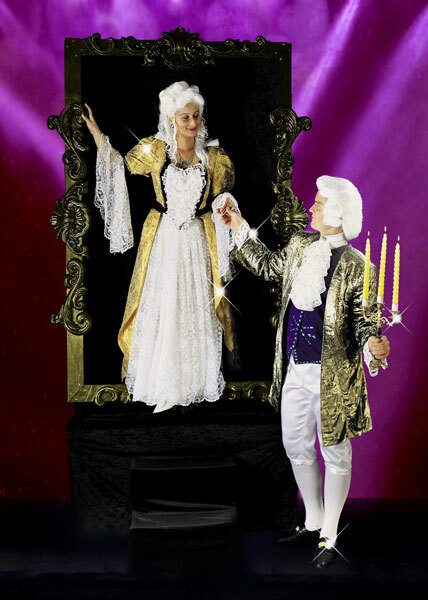 This spectacular programme item is performed in splendid baroque/rococo costumes. Believe or not, this is not a mere illusion (photo). 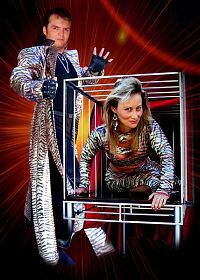 Excalibur - Another thrilling illusion with a dramatic ending from David Copperfield's repertoire. A woman levitates on the point of a sword that will pervade her body in the very end. The illusion is so convincing that those who have a weak nature should close their eyes... (photo). Mysterious Escape - Magicians' quickness is usually higher than your eyes. A tied-down girl outwits an unsuspecting volunteer who, to his surprise, will lose his jacket. A very popular illusion with any company having a good sense of humour. Chinese Rings - A famous illusion with giant Chinese rings. The oldest trick in the world that has not so far been disclosed. This illusion can be performed directly amidst spectators, who can watch and check everything and be involved in the show. Twister - A funny illusion during which not only the magician partner's head will begin to spin. Unbelievable! Pink Panther - A little bit crazy inspector Clouseau takes it into his head to teach somebody to perform magic. Arabian Story - A fairy-tale Arabian dancer runs three sharp daggers and a lighted candle through her hand... (photo). Magic Ball - A mysterious magic ball levitates directly above the spectators' heads. 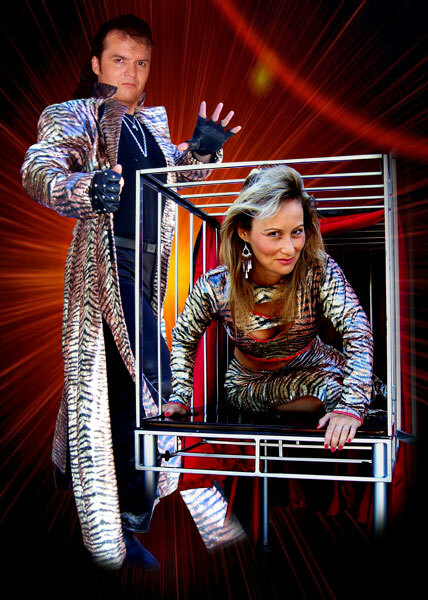 THE MYSTERY BOX - A person disappearing in a box suspended just in the middle of the stage and her reappearing among the spectators (photo). 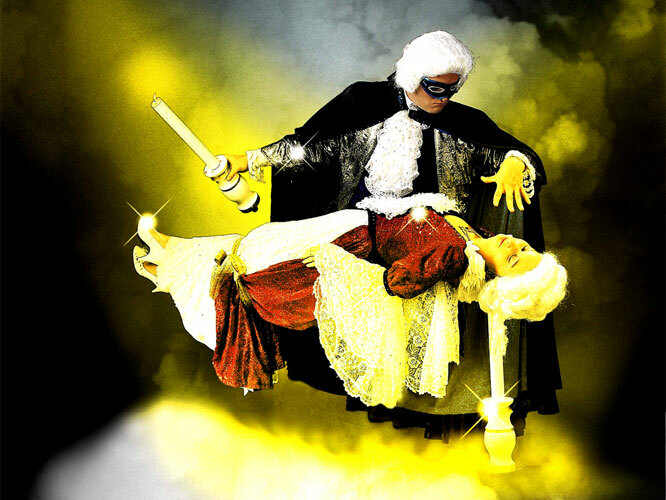 DRACULA´S DREAM - A scene in an old castle where a girl from a picture who has come to life levitates on rococo candlesticks. Impressive decorations, period costumes, a mysterious atmosphere... (photo). ZROZENÍ SIRAEL - Splendid costumes dating back to the end of the sixteenth century. Beautiful Sirael from an old painting comes to life and levitates as she is very slight. 2008 - 2019 © Adrenalin Illusion Show - The latest show, fantastic entertainment and the choice from the best illusions.